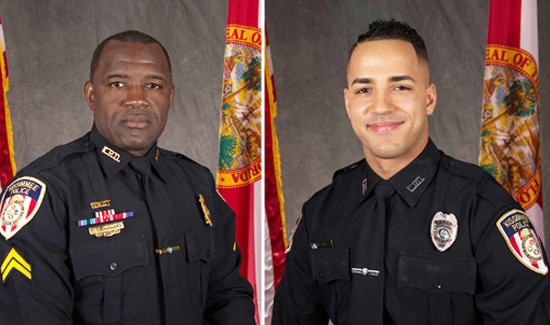 Officer Matthew Baxter (right), was 27 years old. He was the father of four children. Sgt. Richard “Sam” Howard (left), had one child. In a span of less than two hours Friday night, six peace officers were shot in three different locations—four in Florida, two in Pennsylvania. 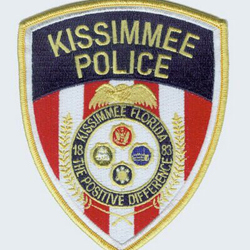 Two officers from the Kissimmee Police Dept., in Osceola County, died of gunshot injuries sustained when they responded to a call. Kissimmee Officer Matthew Baxter, 27 years old, is the father of four children. Sgt. Sam Howard, 36, has one child. Chief O’Dell said evidence so far indicate the attack might have been an ambush. The alleged gunman has been arrested. O’Dell said this tragedy is especially difficult for members of his agency, as they must press forward while suffering the loss of a co-worker and friend. O’Dell praised other police agencies, including the Osceola and Orange sheriff’s offices and Orlando Police Department, for their help. “Everyone came to the scene without being asked,” O’Dell said. The last Kissimmee officer killed on the job was shot in 1983. 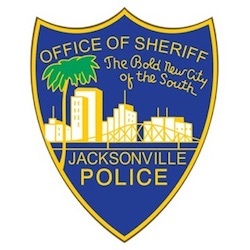 In Jacksonville County, Florida, two officers were shot responding to a suicide call. When the officers were en route, the suspect armed himself with a high-powered rifle and started firing on the officers when the arrived on the scene. A gunfight ensued and the suspect was hit. One officer was struck in both hands, the other was hit in the stomach—both with high-powered rifle rounds. Three victims hiding inside the house were all safe. 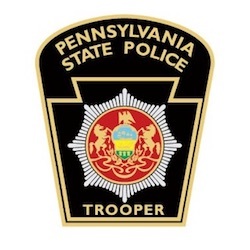 In Pennsylvania, a state trooper is in critical condition after a man opened fire on him and his partner last night in Fayette County in a senseless, inexplicable act of violence. The Troopers were assigned to the Criminal Investigation Unit. They were shot as they attempted to question a suspect who was thought to be selling a stolen item related to recent burglaries in the area. Authorities said the troopers had arranged a meeting via Facebook with a person selling a video game console they suspected had been taken in a string of robberies in Uniontown and Waynesburg. They said the officers met Belsar outside the Stop ‘n Save in Fairchance, about 52 miles south of Pittsburgh, and identified themselves as police officers. Police said the suspect began to walk way and ignored the officers’ commands to stop before a struggle ensued as the troopers tried to arrest him. The suspect pulled a .38 caliber revolver from his waistband and fired a shot that injured one trooper in the hand and struck the other in the abdomen, police said. Both troopers then returned fire, killing the suspect, authorities said. State police Capt. Joseph Ruggery said at a news conference today that the trooper who was critically injured remained hospitalized at Ruby Memorial Hospital in Morgantown, West Virginia, but is expected to recover. “His prognosis is good,” Ruggery said. He also thanked people who were on the scene for their “selflessness and bravery” in trying to help the officers. “It should be noted that multiple witnesses were present in the immediate vicinity and several disregarded their own personal safety to approach the wounded troopers and attempt to render first aid to them,” Ruggery said. When the suspect saw the troopers approaching, he began to walk away and ignored commands to stop. The troopers attempted to stop Belsar and a struggle ensued. 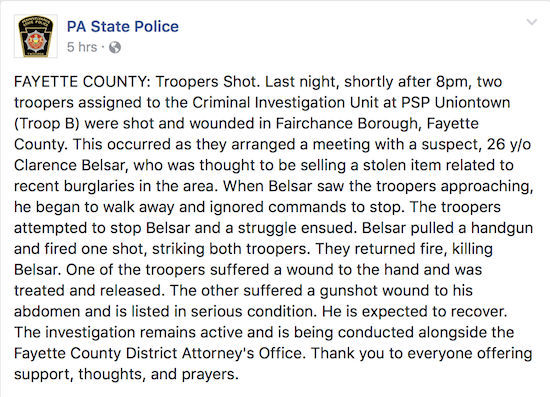 Belsar pulled a handgun and fired one shot, striking both troopers. They returned fire, killing Belsar. One of the troopers suffered a wound to the hand and was treated and released. The other suffered a gunshot wound to his abdomen and is listed in serious condition. He is expected to recover. The investigation remains active and is being conducted alongside the Fayette County District Attorney’s Office.